I’m one of those people who cannot remember definitions of anything or quote examples at the right moment or even remember what exactly happened when I got the idea in my mind. I just remember I got the idea, my beliefs are composed of all the things I heard and learned in life but I cannot exactly say what was the initial fact that got it in my head. I don’t deal in facts and definitions – I deal in ideas and thoughts. Does that make sense? So, I can’t give you a definition what anything extreme in perfume should be like. Because I just don’t know it. But I got a general idea of what it means to me when applied to Incense Extreme by Andy Tauer. The extremeness of this perfume for me lies in the fact that I never thought incense could smell refreshing. Most of the time, incense is not a note I can wear. Yes, I can enjoy it in small quantities, especially if it’s not reminiscent of churches. But, I generally don’t have an urge to wear it except for special, thoughtfully relaxing situations. I’m not going to talk about how it smells much. It starts off sharpishly refreshing, lightly tinged with green and I thought I caught barest powdery wisps in there. A bit later, I get something smoky and to me, something that smelled a bit like smoked meat. 🙂 Anyway, the drydown is the most masculine of the perfume but that is no deterrent in my case. I do believe this is my favourite of the line, even though it’s hard to choose among several Tauers I love. Ines, I agree with your review, too: the extrême part of this incense perfume seems to lie in its single-minded focus, not in its concentration. This is one of the easiest wearing and most enjoyable incense fragrances I've ever tried; in some ways, it's not even like most of the Tauer fragrances, as it seems to have been created with a defter hand than most of them. 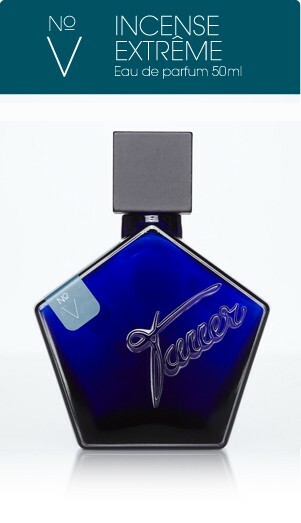 This is probably my favourite Tauer perfume Ines. You're right, it is both complex and fresh at the same time, although to me the freshness is not that conjured up by men's shower gel commercials, but rather of outdoors, fresh air and wind, at least to me!